It’s official! District 7 finally has a new City Council representative – Councilwoman Deb Gross. Councilwoman Gross was elected by District 7 voters to fulfill the rest of former-Councilman Patrick Dowd’s term, which will run through 2015. Deb has a long history of community involvement, specifically with regards to her work with local non-profits and the arts. 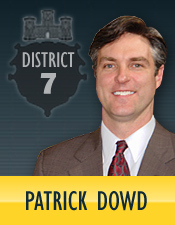 For Deb’s full biography, take a look at her bio page on the new District 7 website. We are also proud to announce the new installment of the D7 team, which consists of two familiar faces in newly expanded roles. Take a look at our meet the team page, and be sure to stay in touch! The Produce Terminal is one of the Strip District’s architectural and historic keystones, and is at the center of one of the most integral sites to be developed under the comprehensive Allegheny River Green Boulevard plan. The Green Boulevard plan, perhaps the most comprehensive plan for development in Pittsburgh, will set the tone for Pittsburgh’s future, with its most dramatic impact occurring in District 7. Since being elected to serve the residents of District 7, Deb has been a vocal advocate for a delay in the sale of the Produce Terminal building, and has been outspoken in her stance that any proposed alterations of the building should occur under the careful oversight of City Council. Stay tuned to the District 7 Facebook and Twitter pages for real-time updates on the fate of the Produce Terminal and how Councilwoman Gross is leading the charge to ensure that this essential piece of the Strip’s past is best utilized in comprehensive developments that will shape the neighborhood’s future. Do you have a great idea for Deb and the new D7 office? Let us know! With a new City Council representative and an updated staff, the District 7 office is excited to hear your suggestions about what changes or initiatives you’d like to see in your neighborhood. Hitting the ground running to serve D7 neighbors is Deb’s highest priority during the transition. Please use the feedback form on the District 7 webpage to let us know what you’d like to see our office do to help your neighborhood. From bike infrastructure to zoning issues to economic development and public safety, Councilwoman Gross is excited to hear what you think! There will be a public presentation regarding a proposed residential development in Polish Hill at the January meeting of the Polish Hill Civic Association, which will be held on Tuesday, January 7th in the basement of the West Penn Recreation Center at 6:30 pm. Listen to District 7 Councilwoman Deb Gross talk with Highland Park neighbors at the January meeting of the Highland Park Community Council, which will be held on Thursday, January 16th at the Union Project at 801 N. Negley Avenue, beginning at 7 pm. Deb will discuss her progress representing District 7 since her swearing-in in early December, as well as talk with Highland Park residents and stakeholders about their ideas and requests for the district. Would you like to learn more about the Affordable Care Act and how it will affect you? Join your neighbors at the Lawrenceville branch of the Carnegie Library of Pittsburgh for an ACA information session and enrollment assistance seminar on Saturday, January 18 at 10 am. At the information session, you will be able to learn more about how health insurance works and what programs you and your family may be eligible for. Did you know that Pittsburgh City Council elects the City Council President immediately following the swearing-in of newly elected and re-elected members? This year’s vote for Council President will occur on January 6th, immediately following the swearing-in ceremony for the new Council. Election Day in District 7 — Today! This year’s Election Day will include the opportunity for District 7 residents to vote for a representative to fill the currently vacant City Council District 7 seat. For information about Election Day, residents are encouraged to take a look at the Allegheny County Elections Division’s webpage, where information about registration, absentee ballots, and clarification regarding voter identification is available. Need to find your polling place? Visit the Pennsylvania Voter Services website, where registered voters can enter address information to find their designated polling location. While watching the leaves change is one of our favorite things about the fall months, cleaning up and properly disposing of leaves is an important basic quality of life issues in our neighborhoods during the fall season. To better serve District 7 constituents, we’ve put together this blurb about special DPW fall yard debris pickup dates, yard debris drop-off center locations and requirements. Follow this link to access the leaf and yard debris disposal article hosted on the District 7 website. The Office of City Council District 7 is excited to announce that Allegheny CleanWays’ Dumpbusters will be clearing one of the illegal dump sites in the Allegheny River Greenway* which we reported to them this summer. The clean up will be held on Saturday, November 9th from 9:30am to 1:00pm. This includes a training at the start and pizza at the end. For more information and to register with Allegheny CleanWays, visit this link. For questions, contact Leah Thill at 412-381-1301 or email leah.thill@alleghenycleanways.org. *The Allegheny River Greenway is the preserved green space on the edge of Stanton Heights and Morningside near Butler Street. The 9th annual Lawrenceville Artist’s Studio Tour will be held on Saturday, November 2nd from 10 AM until 6 PM. This year’s self-guided tour is the largest ever, and includes 17 studios and 42 artists. For a list of studios and a tour map, take a look at the Lawrenceville Artist’s Studio Tour 2013 Facebook page, or call 412-683-6488. The Zone 5 Public Safety Council will hold its November meeting on Tuesday, November 12th at 7 PM at the Union Project at 801 N. Negley Avenue. A special guest speaker from the of City of Pittsburgh’s Department of Public Safety will be on hand to talk about a plan to increase the number of cameras used to improve public safety in Zone 5. On the evening of Thursday November 21st State Senator Jim Ferlo, Highmark officials, and West Penn Hospital staff will host a Town Hall Meeting at the Teamsters Temple (4701 Butler Street) from 6-8 PM. During the meeting, Highmark and West Penn officials will report on their progress in promoting health and sustaining vital medical services to insure the success of West Penn Hospital. The meeting is free and open to the public. Because the November 5th election to fill the vacant District 7 City Council seat is a special election, its winner could be sworn in once the election results are officially certified by the Allegheny County Elections Division. This process generally takes about two weeks after Election Day results are collected. The neighborhood newsletter, the Polish Hill Voice, is mailed to PHCA members and is also available at some local businesses and at the church. But many residents still don’t see the newsletter, and many who aren’t online don’t see Blogski or receive the e-blast — other places where we provide updates on neighborhood happenings and PHCA projects. We would like to help keep more residents informed about neighborhood news and developments. To that end, the PHCA is now working to get funding to print and mail copies of the Voice to every household in Polish Hill. Until that funding is in place, we’re calling for volunteers to help us distribute the November issue of the newsletter. This is something that volunteers can do at their own, and a number of people have stepped forward to help out. But there are still a number of streets left for distribution. If you have an hour or two to spare sometime in the next several days, and would be willing to help out, please contact us. Call 412.681.1950 or email phca@phcapgh.org. 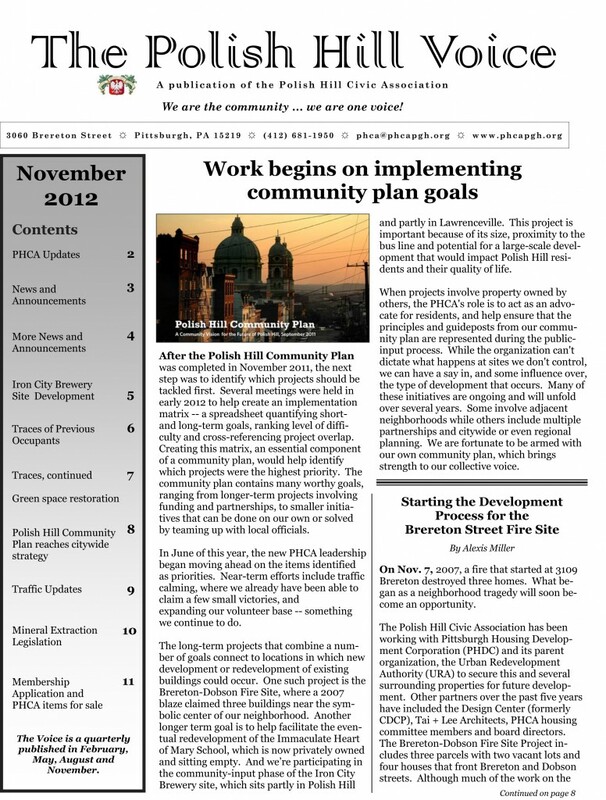 Here is the current (November) issue of the Polish Hill Voice, and here is the page with more back issues. The Carnegie Library of Pittsburgh (CLP) Board of Trustees has appointed City Council District 7 representative, Councilman Patrick Dowd, to serve as a Public Representative on the Executive Committee of the CLP’s Board of Trustees. In the Carnegie Library’s May 14, 2012 Board of Trustees meeting the Board entertained candidates for election to the CLP Executive Committee, which acts as the primary steering committee for the CLP Board of Trustees. Thanks to a Highland Park constituent request, Councilman Dowd and the District 7 office worked with Pittsburgh Citiparks to bring Pittsburgh Citiparks “Cinema in the Park” series to Reservoir Drive in Highland Park. The popular summer series will also be returning to Lawrenceville’s Arsenal Park. Click here to find the lineup of family-friendly popular films to be shown free of charge in two of District 7’s best summer venues. Join PRESERVEPGH on June 13th from 6:00pm-8:00pm at Bakery Square, 6425 Penn Avenue for a public forum and voice your opinions about the program and its goals. PRESERVEPGH is a program run through the City of Pittsburgh Planning Department focusing on putting together a master plan for the City while also preserving important pieces of historical architecture. More information about PRESERVEPGH is available at www.planpgh.com/preservepgh. District 7 Welcomes New Staff! District 7 is very excited to welcome Nathaniel Hanson as the District 7 team’s new Communications and Administration Manager. Nate, a District 7 resident, lives in Lawrenceville and already loves working in the District 7 office. Mrs. Karen Barry for dedicating over 40 years of her life to positively impacting students from Bloomfield and the surrounding neighborhoods as a kindergarten teacher at Immaculate Conception School in Bloomfield. Mrs. Barry was nominated to receive City recognition by Immaculate Conception School 8th grade student, Rebecca Pietropaolo. Join Councilman Patrick Dowd and his staff at Council to Go, his mobile district office, to voice your concerns, ideas, and questions about local government and services. Morningside – Thursday, June 7, 7:00pm-8:00pm – Meet at the Intersection of Greenwood and Chislett Streets and join Councilman Dowd and his staff on a walk through Morningside. June 6th-9th, 321 Edmond Street – Join Immaculate Conception and St. Joseph’s for their Parish Festival from 6 to 10:30 pm for games, rides, and food . Dinner will be served from 4-7pm. Call 412-621-5199 with any questions. June 12th, 6:30pm, Lawrenceville Goodwill, 118 52nd Street – Lawrenceville United will be holding its General Membership Meeting, where Lawrenceville residents will be able to renew their LU memberships and find out about happenings throughout Lawrenceville. June 16th, 11:00am-4:00pm – Join fellow garden lovers for the Lawrenceville Garden Tour. The tour is free of charge and open to the public, providing a fun filled afternoon beginning at the Lawrenceville Organic Community Garden, located in the Allegheny Cemetery near the Butler Street entrance. City public pools are set to open on June 14th. Daily admission cost is $3 for children ages 3-15 and $4 for individuals 16 and older. Season passes are also available for children, adults, and families. Pools are open Monday-Friday, 1:00pm-7:45pm and Saturdays, Sundays, and Holidays, 1:00pm-5:45pm. Public pools in District 7 are the Bloomfield Pool, Highland Park Pool, and West Penn Pool (in Polish Hill). More information about pool hours and season passes is available here. The average person in the United States uses anywhere from 80-100 gallons of water per day. Flushing the toilet actually takes up the largest amount of this water. Conserving water in the hot summer months goes a long way towards environmental health, while also helping to cut everyday costs. By installing more efficient water fixtures and regularly checking for leaks, households can reduce daily indoor per capita water use by about 35% to about 45.2 gallons per day. In Pittsburgh, the Pittsburgh Water and Sewer Authority compiles a report detailing the quality of Pittsburgh’s drinking water. The report outlines where drinking water comes from and how it is treated. Read the report here to better stay informed about each and every drop of your 80-100 gallons. The Department of Public Works has begun the 2012 paving season. This year’s $11.3 million budget will allow the City to pave about 60 miles of City streets. Based on environmental conditions, the street paving work season is performed between April 15 and November 20. To find out which streets in District 7 are being resurfaced this season and how streets are prioritized, visit the City’s PAVEMENT PLAN . You can also follow “@CityPGH_DPW” on Twitter, or call the Mayor’s 3-1-1 response line for more details. Comcast for their 11th annual Comcast Cares Day which included a clean-up project in Stanton Heights to make way for a proposed community green space, as well as other important projects in the West End and the North Side. District 7 office bids farewell to Jen, Hello to new staff! This month brings change to the District 7 office as our Director of Communications and Administration, Jennifer Thoma, leaves to fill a position at Chatham University. We will miss Jen dearly and thank her for all her hard work and dedication to District 7! Also, the District 7 office welcomes Moira Egler to the team as Constituent Services Assistant. Stay tuned for an update on our new Communications and Administration Manager! Saturday, May 12th, 11:00am-4:30pm, Baum Grove, — At the intersection of Harriet, Fairmount, and Roup Streets in Friendship will be the Friendship Flower and Folk Festival for music, fresh flowers, food, raffles, and demonstrations. Locally grown flowers, vegetables, and perennials will be for sale to support the mainternance of Baum Grove. There will also be demonstrations on sustainable practices, gardening, and fitness. Thursday, May 17th, 6:00pm, Teamster Temple, 4701 Butler Street — The Zone 2 and Zone 5 Citizens Public Safety Councils, with the support of the Zone 4 command, are excited to announce a city-wide public safety meeting for Pittsburgh residents on “Summertime Safety for Youth”. This meeting will cover various city programs and policies to keep our youth safe and out of trouble in the summer, as well as general updates from our Public Safety divisions and a special presentation from the Mayor’s Office. Your RSVP by Thursday, May 10th would be appreciated for food orders. Questions and RSVPs can be sent to Melanie Brown at melanieb.1@verizon.net. Each Department of the City of Pittsburgh is responsible for archiving their own historic documents, whether they are old maps from City Planning, past Council archives and legislation in the City Clerk’s Office, or essential documents from the City Controller’s Office. The Pennsylvania State Code requires all municipalities and counties that are NOT first and second class cities care for their historic documents in an archive maintained by the governing body. Municipalities or counties that are not able to adequately care for their documents are required to hand them over to the state’s Historical and Museum Commission. The Union Project, in partnership with the Kelly Strayhorn Theatre, is now accepting applications for SOUNDWAVES, a new steelband ensemble for teens. Participation is free, but registration and an audition are required. Students who are 13-18 that have a passion for playing music are encouraged to apply. A small instrumental rental fee will be charged. The six-week program will culminate in a public performance at the theater, while rehearsals will be held at Union Project in Highland Park. Applications are due on Monday, April 2. View the application here or learn more about SOUNDWAVES here. The proposed Stanton Heights parklet will be one of the sites of a Comcast Cares Day on Saturday, April 21, 2012. Allegheny Cleanways and Comcast Cares are partnering to clean up the site at the corner of Stanton Avenue and Woodbine Street in preparation for consideration of developing a passive park on this property in Stanton Heights. The proposed park will incorporate a short walking trail, native plantings, local art and historic interpretation. For more information on the park or Comcast Cares Day please contact jennifer.thoma@pittsburghpa.gov. The Polish Hill Civic Association is the recipient of one of Mayor Luke Ravenstahl’s Love Your Block grant awards. Love Your Block is an innovative partnership between the City of Pittsburgh, The Home Depot Foundation and local residents that works to revitalize Pittsburgh neighborhoods – block by block. Polish Hill will use their $500 award to purchase supplies and equipment to beautify two vacant lots by planting gardens and improving the surrounding area. Forbes Hospice and all of their social workers for their compassionate and dedicated service; in recognition of National Social Work Month. Pat Bigley, Thomas Donnelly, Dennis Gillenberger, Mitchell Hovanec and Chuck Zezza for preventing a potential tragedy stemming from a significant gasleak near Peabody High School through their leadership, resourcefulness and initiative. Join Councilman Patrick Dowd at Council to Go, his mobile district office, to voice your concerns, ideas, and questions about local government and services. Lawrenceville — Friday, April 20, 7:30am-9am — Perk Me Up, 4407 Butler Street, Pittsburgh, PA 15201. Morningside — Thursday, April 26, 7pm-8pm — St. Raphael’s Multi-purpose Room, 1118 Chilett Street, Pittsburgh, PA 15206. Saturday April 7, 9:30am-8pm — The Union Project will be hosting a Monster Open House; a full day of family freindly, monster-themed activities featuring artmaking, collaboration,learning opportunities and an evening dance aprty.Visit unionproject.org for more information. Friday, April 20, 10am-1pm — Job Fair – Ross Community Center, 1000 Ross Municipal Drive, Pittsburgh, 15237. Come meet with local, state, and federal employers who are currently hiring. Applications will be accepted on site. Those attending are encouraged to bring several copies of their resume. Free and open to the public. Organized by Representative Dom Costa. 412-361-2040 for more information. Saturday, April 28, 9am-12noon — Representative Dom Costa will be holding a Shredding and eWaste Recycling event at St. Raphael’s parking Lot at 1154 Chislett Street. Bring All documents you no longer need that contain personal information, including Social Security numbers, credit card numbers and bank account numbers, etc.. Accepted eWaste includes desktop and laptop computers, computer accessories, TV’s, VCR’s, Cell Phones, etc. Free and open to the public. 412-361-2040 for more information. Saturday, April 28 & 29 – 15th Annual Art All Night at Willow Development, 4001 Willow Street in Lawrenceville. Art All Night is a grassroots event staged by an all-volunteer crew. A celebration of the arts and community, the show grows in popularity each year, bringing thousands of people from all over the region into Lawrenceville. In 2011 Art All Night Lawrenceville featured work by 1280 artists and was attended by over 12,000 guests. Free and open to the public. For more info, please contact info@artallnight.org. If you know of any community-oriented events in your District 7 neighborhood that we should publicize through our monthly newsletter and District 7 website, please email Jennifer Thoma by the 1st of each month. Prince Gallitzin State Park, located in Cambria County, Pennsylvania, east of Pittsburgh, features 1600-acre Glendale Lake, a large campground, and plenty of trails, scenic vistas and other recreational opportunities. McConnells Mill State Park, located in Butler County, Pennsylvania, north of Pittsburgh, features the 3225-acre Lake Arthur for fishing, sailing, swimming and boating, plus hiking and bicycling trails, picnic areas and hunting. Moraine State Park, located in Butler County, Pennsylvania, north of Pittsburgh, features the 3225-acre Lake Arthur for fishing, sailing, swimming and boating, plus hiking and bicycling trails, picnic areas and hunting. Ohiopyle State Park is arguably one of the most scenic state parks in the state of Pennsylvania. Learn about its many attractions, including whitewater rafting, hiking, biking, camping and waterfalls, and get the information you need to plan your Ohiopyle visit. Point State Park, located at the point where three rivers meet in downtown Pittsburgh, provides a nice oasis for downtown workers and visitors. Learn about the interesting attractions of this tiny city park. Raccoon Creek State Park is one of the largest and most beautiful state parks in Pennsylvania, and features the 101-acre Raccoon Lake. Learn about its many attractions, including boating, fishing, hiking, biking and camping, and get the information you need to plan your visit to Raccoon Creek State Park. Hillman State Park, located in Washington County, is primarily maintained for hunting, and also offers hiking trails. This wonderful education center in Butler County covers approximately 300 acres and offers hiking and other nature related programs, including a relict prarie. Located in Greene County, southwest of Pittsburgh, Ryerson Station encompasses over 1,000 acres near the West Virginia border. The park offers camping, picnicking, hunting, fishing, boating, hiking, swimming, sledding, ice fishing, snowmobiling and cross country skiing.